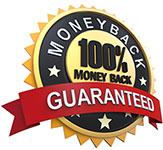 6 month 100% Money Back Guarantee! Although we have every confidence in our fabulous Free Cash Grant product we realize that not everyone will be 100% satisfied. That is why we are offering our 6. Month Guarantee. We don't have a 30 or 60 day time limit like our competitors. We want you to be completely satisfied with your purchase. If you are unable to obtain a grant or a loan Simply send the Book or CD back to us for a complete refund! For complete details please read Terms & Conditions.